Do you love teaching yoga but sense a disdainful undertone toward yoga teachers who promote themselves? Yoga Teacher: If I put myself on Facebook in beautiful yoga poses, create a brand and a website, doesn’t that go against yoga’s values? Amy: This question is a hot one right now. 1. Put hundreds of hours of teacher training under your belt. 2. Done copious amounts of continuing education. 3. Traveled long distances to learn. 4. Invested greatly in your education. 5. Live and breathe teaching. 6. Served students to the fullest. Despite this, many yoga teachers are poo poo’ed as unprofessional, flakey, scattered and/or held in contempt for promoting themselves. This can be infuriating when you’ve invested so much time building your skill set and creating something of value to offer. You’ve worked hard on making your offering authentic, proficient and meaningful. Yoga teachers may get “push back” from the media and others who feel that self-promotion and spiritual practice is like mixing oil and water, and that marketing is at best, tacky and inappropriate. Yoga teachers, much like any other professional (such as healers, doctors, massage therapists, computer consultants etc), want to get the word out about their services. Unfortunately, the result of this push back toward yoga teachers is that they are petrified to get the word out or to use social media for their cause. We could debate the philosophical arguments on whether spirituality and self-promotion are in fact so diametrically opposed. Historically, there are some traditions that argue for asceticism and renunciation, but there are also those traditions (way less prominent voices in the conversation) which invite us into the physical world where engaging in money and transaction are actually considered part of living a skillful life as a yogi. The teacher has a responsibility to provide meaningful teachings and the student is also responsible for choosing which teacher suits them best. We’ll leave that topic for the scholars to more fully flush out. It’s a shame that this conundrum around marketing and spirituality has made yoga teachers gun-shy about promoting themselves when they are skilled at offering the very things that help people gain access to these benefits. If yoga teachers don’t inform people about the merits of yoga and what they can offer as a competent teacher, then how do people find the path to those benefits? Of course, not all yoga teachers have escaped cheesy marketing strategies and their promotions can come across as a bit tawdry. Given the sensitivity and “push back” in the yoga world, how can a yoga teacher get the word out with sophistication and finesse? 1. Define your gifts & goals as a yoga teacher. Do you excel teaching one-on-one? Or do you prefer to teach groups of 10 or less students? Do you work best with children? Women? Men? Or can you more effectively work with a larger reach? Make it clear who you work with in your promotional materials and reach out to that kind of student. Once you are clear on your assets and goals find a way to craft your message that is authentic, totally you, and make it classy. You can’t go wrong if your message shares who you are and what you have to offer with sincerity. Part of tasteful yoga promotion is recognizing that there is indeed touchiness in the yoga world around promotion; therefore, cheesy marketing that overly glamorizes or emphasizes you is not going to cut it. Instead focus on what the student will receive by working with you. Show your promotional material to close friends and students who know you well to get feedback before making it public. 3. Confidently Send Out Your Offering! Be confident and enthusiastic in sharing what you have to provide with others, knowing that you are in service and that what you do makes a difference in the lives of your students. Be unapologetic about your offering. Spread your gifts on a website, professional Facebook page and by email. Some will like it, some will not. You never know, there may be a student out there that has a tremendous shift in their world, because of you! Learn more about our professional education programs for yoga teachers here. Thanks Amy, I'm not sure if I agree with everything you've said but its a well thought out article. I'm not sure how as teachers practising yoga its possible to disentangle from the 'ego' from the sense of "I" separateness at the same time as creating a web-precence for ourselves as individuals. Surely we should be promoting the teachings themselves to students rather than ourselves as inspiring personalities? I just don't know. I do use social media etc to promote classes and I know that it works because people come to my classes but, to be honest, I find it draining, shallow and disingenuous. I just wan't to teach yoga. Anyway, there you go. I realise thats just my stuff. Promoting yoga is a tricky dance, for sure. I've been teaching since 1986. Back in those days teachers didn't need to market themselves. People came to class mostly through referrals, and there was never a lack of students. Now that there are many studios in town, health clubs offering free classes, etc., it is very difficult for me, as an independent teacher, to attract new students. As a quiet introvert, I'm not at all comfortable with self promotion. After so many years of not having to self promote, it's very hard for me to put myself in that mindset. I don't see self promotion as wrong; it is just not comfortable. I'm not alone in this. I know many amazing, experienced, mature, longtime teachers whose teaching practices can't keep up with those of the trendier newcomers. Our youth-obsessed culture doesn't so much value experience. So how do older teachers communicate the value of experience and depth? Amy is a yoga teacher, writer, and philanthropist. She is known for her innovative methods to bridge the gap between ancient yoga wisdom and modern day life. Amy is a pioneer for advanced yoga education serving both students as well as fellow yoga teachers. She co-founded 90Monkeys.com, an online professional development school that has enhanced the skills of yoga teachers and studios in 43 countries around the globe. She has graced the covers of Yoga Journal and Fit Yoga Magazine and has been featured in Yoga International, Self, Origin Magazine, New York Magazine, Yogini Magazine (Japan), Allure (Korea), Elephant Journal, intent.com, and many more. 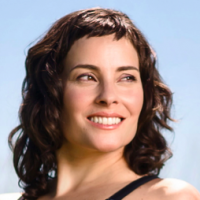 Amy is a faculty member at the Omega Institute, Esalen and Kripalu. She is a regular presenter at the Yoga Journal Conferences, Omega Institute Conference, Wanderlust Festivals, and The Hanuman Festival. Since the age of 14 Amy has been a champion of all forms of eco-consciousness, animal conservation and more recent forays into marine conservation. Website: amyippoliti.com . Hang with Amy on Facebook: AmyIppolitiPage Talk to Amy on Twitter: @Amy-Ippoliti Pin with Amy on Pinterest and share your pics with her on Instagram.